Image © DC Comics. Written by Joshua Williamson, art by Rafa Sandoval & Jordi Tarragona, colors by Tomeu Morey, letters by Steve Wands. I haven’t read FLASH for a while, so I’m backtracking a bit to the start of the “Force Quest” storyline. Barry and Iris are in the obviously-named Middle-eastern country of Badhnisia looking for information about the Strength Force, one of several new forces recently uncovered besides the Speed Force that give Flash his powers. After an entertaining pursuit by Barry of a purse-snatcher, they arrive at an old church, now apartments, to find the place they are looking for ransacked by costumed criminals, Gemini. 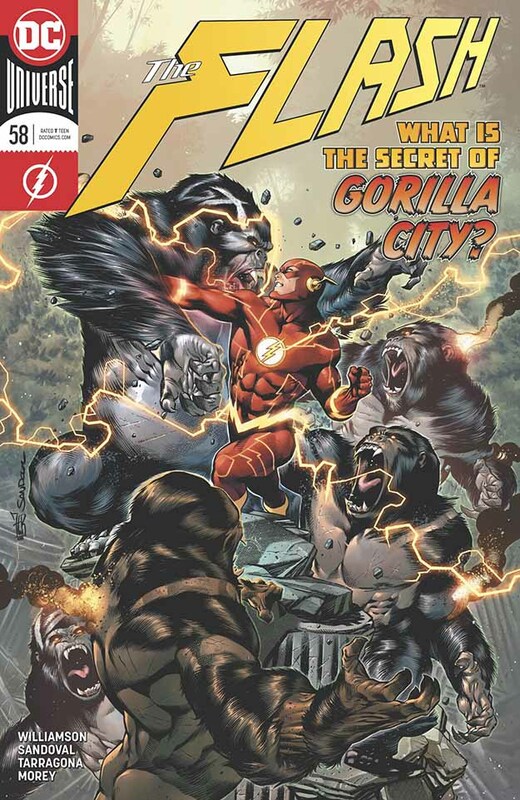 The final scene, and only the final scene of the issue is in Gorilla City, more of a teaser than anything, despite the cover image. This was a good read, I like the writing and art. Flash’s world was too complicated already even before new “forces” were introduced, but I’ll see how things go in this story. This entry was posted in Comics, Reviews on January 30, 2019 by Todd. I liked the speed force as originally introduced (Peter David? Mark Waid?) but agree it’s gotten way too convoluted since then. Haven’t read an issue apart from the occasional tie-in or variant cover in years. But the prospect of another visit to Gorilla City may prompt another purchase – thanks for these details. Badhnisia was actually introduced back in Flash Comics #1. No, not that one—the very first, back in 1940! It’s where Johnny Thunder came from. In that story, it was an island in the South Pacific. I don’t know if it’s been moved in the modern continuity.